Violent weather killed three people in the southwestern German state of Baden-Wurttemberg, a spokesperson for the region’s interior ministry said. The majority of destruction took place in the town of Schwabisch Gmund where a firefighter was killed as he attempted to rescue another person who also died in the floods. Separately, a 60-year-old man drowned in a Weissbach underground car park after it filled with rainwater, according to Reuters. Footage released of the severe weather from the town of Braunsbach showed mudslides, toppled trees and damaged cars floating in the water. The force of the water was seen pushing several cars ‘downstream’, including a firetruck which still has its lights flashing. In Schwaebisch Hall, similar images captured on camera show the devastation of the rains from Sunday. 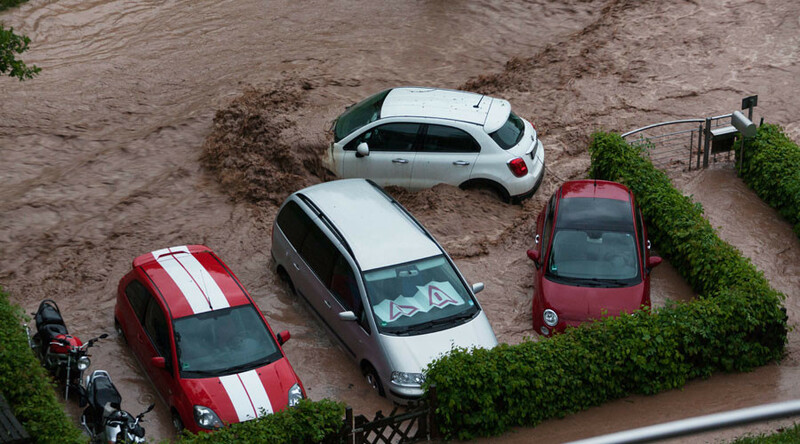 Dozens of vehicles were reportedly submerged while stranded motorists had to be rescued by emergency services across the region, Deutsche Welle reported.